Gaming Equipment and Supplies ° Playing Cards ° Casino Dice and Cards ° Custom Clay Poker and Casino Chips ° Money Wheels ° Prize Wheels ° Raffle Drums ° Poker Cards and Tables ° Bingo Supplies and More! 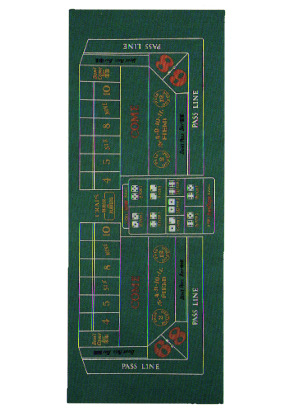 Enjoy this home-style 36" x 72" craps layout. Perfect for those home craps games!